Finding time to get things done, especially at night, is not my thing. I am usually pretty wiped out from my days and get pretty lazy. 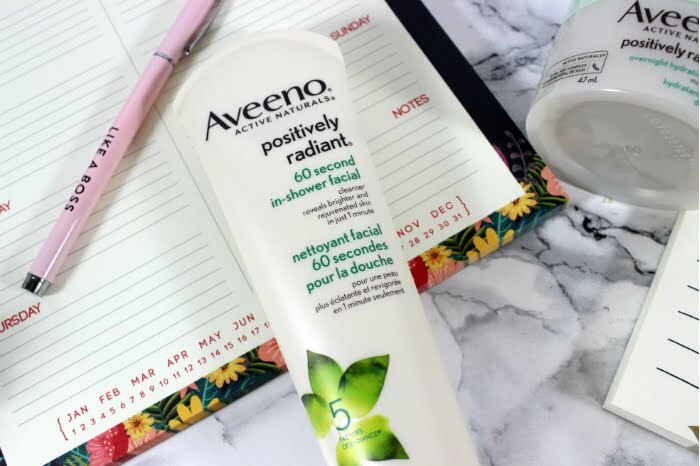 Lucky for me Aveeno has some great new products from their Positively Radiant line that help me get maximum benefit for my skin with minimal time and effort. 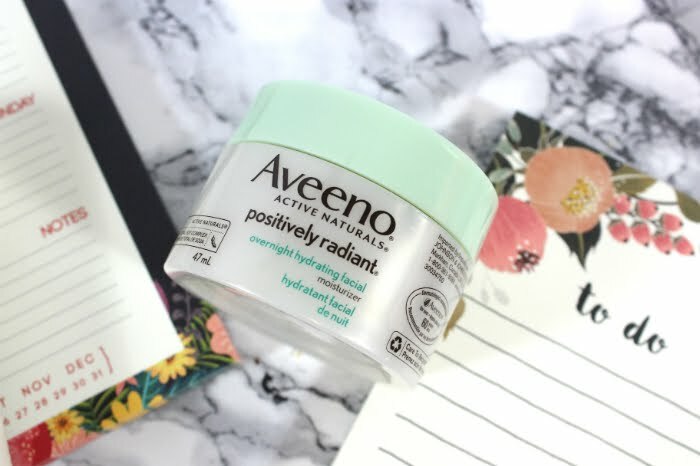 Aveeno's Positively Radiant line helps with 5 factors of radiance, tone, texture, dullness, blotchiness and brown spots. A facial is something I 100% do not have time for right now. Sadly my skin is paying the price. I really love that this product exists for that reason. It is a face wash with a mild chemical exfoliant in it that helps you get your face clean and removes dead skin while you are in the shower. In 60 seconds it cleans, exfoliates and gives you fresher skin. I usually use this after I wash my hair and apply conditioner (I have to leave that on for 2 minutes so it is a good use of the time). The product works with the steam in your shower to work even better. I really enjoy the texture of the wash, it is creamy with a very minor texture to it. I do find it does a great job of cleaning my face and getting rid of all the makeup and dirt on my face. Like all washes I find it works best when you use a makeup remover first. I like that it is a convent in shower product that I can use when I am already in the shower and not before or after, it almost isn't a step at all. The only downside is that my washroom doesn't get overly steamy, or I should say it takes a long time to get steamy, so I never know if it could be working better or not. I really want to invest in a facial steamer machine anyways, and I highly suspect it would be great to use with that. WEather or not the steam in my place could be more effective with this product, I do really like that it is meant for in shower use. I now have a cleanser / exfoliant specifically designated for my shower and I reach for it quite a bit just because of that. Face masks are my favourite skin care thing in the whole world, and sadly I get so busy that even a simple sheet mask will go without being used because I just honestly don't have the time to use them or forget. This might be why I love sleep masks so much, you just use them in place (or in addition) to your normal night time routine and leave them be. 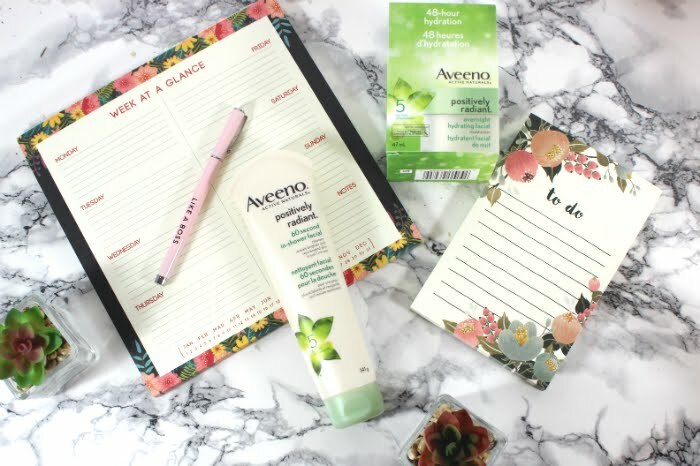 While many sleep masks require you to rinse them in the morning, not this Aveeno one, you just leave it on, which I really like. At night, after you've cleansed, just apply a thick layer of the Overnight Facial and let it do its work. Wake up with softer and nourished skin. Easy, which is why I like it. It is a pretty normal night cream consistency, not too thick. It also has a minor amount of mica in it, so you will find a shimmer on your face in the morning, which is supposed to leave you more radiant. 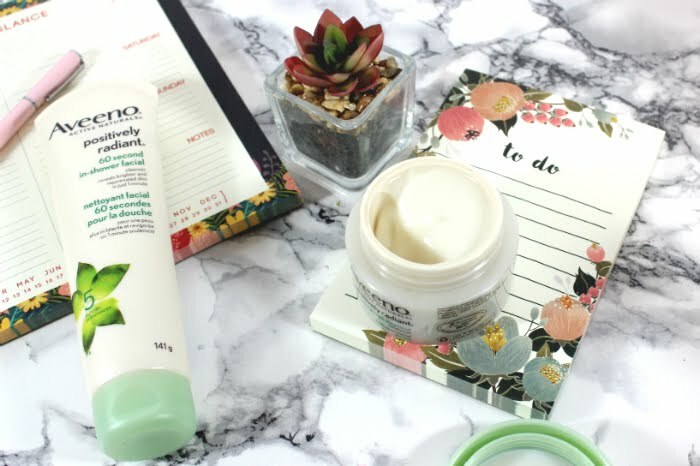 Since I have very dry skin, it gets absorbed quickly and doesn't linger too long on it. That being said no night mask dose. I do love the texture and feel of it. 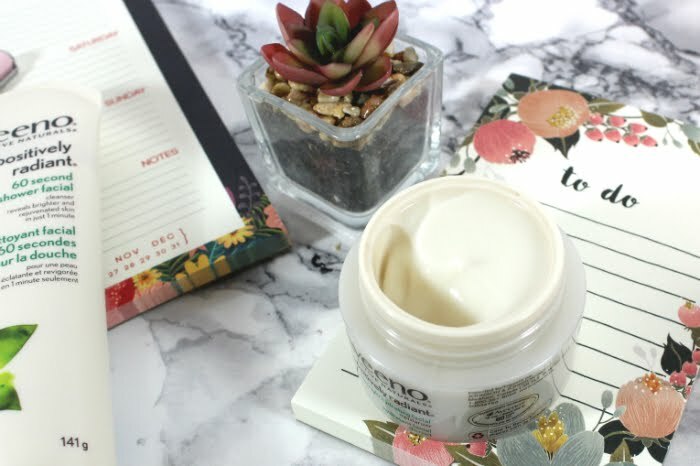 Every morning after I have used it, my skin feels hydrated and soft and generally more plump then when I do not. 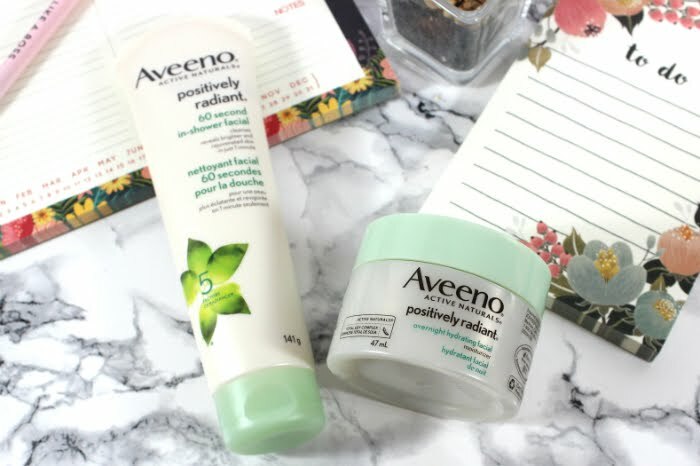 Overall, the Positively Radiant line of skin care products is one I really like and these two facial products that save me time and energy are no exceptions. I really like how they work quickly and effectively with no fuss. I usually use the in shower wash at night followed by the sleep mask and wake up with really nice feeling skin, I honestly have been really happy with the results. I would recommend them both to anyone looking to get products that are easy to add to your routine without complicating it, or someone who is looking for a way to get better results from a minimal step routine.